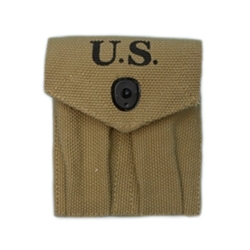 Our .45 Double MAG Pouch is a WWII reproduction single snap closure in khaki color canvas with U.S. markings. Great for WWII reenactors. Slides onto belt, no alice clips!